Heat oven to 400°F. Lightly spray 12 mini muffin cups with cooking spray. Onto sheet of cooking parchment paper, unroll pie crust. Using 2-inch round cutter, cut pie crust into about 12 rounds. Press each crust round into mini muffin cup. Spoon 2 teaspoons lime curd into each pie crust cup. In small bowl, beat egg whites with electric mixer on high speed until stiff peaks form. Gradually add sugar, beating until a soft meringue forms. Spoon meringue into medium-size food-storage plastic bag; seal bag. Cut tiny bottom corner from bag. Squeeze bag to pipe meringue over top of lime curd in each cup. Bake 12 to 15 minutes or until crust cups and meringues are light golden brown. Transfer tarts from muffin cups to cooling rack. Cool about 5 minutes before serving. Lemon pie filling tastes great in this recipe, too! 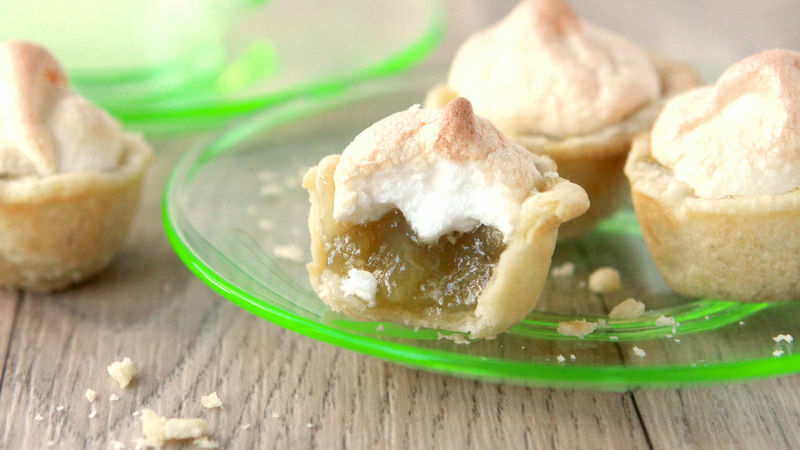 If you're not a fan of meringue, omit that portion of the recipe. Serve the pie tarts with a spoonful of fresh whipped cream!